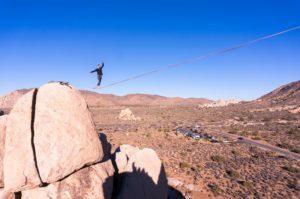 Highline Access in Joshua Tree National Park – Slackline U.S.
Joshua Tree National Park is a classic highline location in southern California. For many years, Joshua Tree National Park has been a welcoming home to highliners with unique boulder terrain and stunning desert sunsets. The Joshua Tree NP rangers host a coffee gathering every weekend during peak months, offering free coffee and conversation with Leave No Trace posters and guides on hand for a quick refresher. Slackline U.S. has maintained a relationship with the park rangers since 2015. We ask that all slackliners respect National Park regulations and participate mindfully within the park. The more highlining grows and the more visible the sport is, the more important our behavior as a community will be in determining the future of access at popular sites like this. Following is a summary of these regulations interspersed with the park’s rationale behind them and some additional notes. Slacklines may be attached to rocks, but not to vegetation. Joshua trees have shallow root systems and cannot handle the torque that a tight line requires. The Joshua trees are iconic and fragile. Even loose slacklines can damage these trees. Please help us protect them. Unattended slacklines and fixed lines will be removed by rangers and the owner will be cited. This builds upon day use and abandoned property regulations. There is an exception for gear to be stashed in a “discrete manner” overnight. Though this exception does not include rigged “set-up” highlines. Please follow all LNT principles as closely as possible at all times. Climbers need to be able to hear each other to climb safely. Please be aware of noise concerns, do not play music or shout unnecessarily in climbing areas. Please be mindful of rockfall at all times. Climbers and hikers are very often below highlines. Seasonal Closures and other park notices are posted on the State Park’s official website. Thanks in large part to the supportive park rangers at Joshua Tree National Park, highlining has a strong future here as long as we continue to act as good stewards for the lands we enjoy. Of particular note, a small group of highliners have recently invested a lot of time and money replacing old or poorly placed highline bolts in JTree. Their efforts are very much appreciated and pave the way for a strong ethic of community involvement in the park. All updates will be shared through conservation and advocacy partners such as Slackline.us. First, please follow all current regulations and best practices within the park. If you’re interested in establishing new lines, be sure to connect with the local community through the Joshua Tree group on Facebook or on site. It is also good practice to check in with the park rangers about new locations to be sure to avoid any issues. Don’t worry, they are quite friendly. Second, we’re always open to new ideas about how to best help the park receive slackliners well and always advocate for our own needs. If you have any good ones, send us a message! Lastly, please consider donating to Slackline.US to protect the future of highlining in all of our treasured spaces. Thank you and Happy Slacking!